A long, long time ago, in the shadow of Creation, some animals were different than they are today. Many animals had the powers of thought and speech and some were a mixture of two or more animals. One of those animals was called Goat. 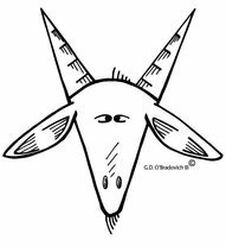 Goat was similar to other goats of his and our time, but Goat was different because he had a fish tail and not, as would be expected, hind legs. Goat knew he had a fish tail and perhaps he was embarrassed by it, but he never talked about it. The other goats didn’t talk about his tail to either Goat or among themselves. After some time, Goat became their leader and he guided his fellow goats from high hills to mountains and back again searching for food. After many years of leading the herd, Goat desired to see places other than mountains and hills. Although his work was not difficult, Goat wanted someone reliable as his replacement. When Goat was confident that there was a suitable replacement, he started his journey to unexplored lands. After several days, Goat reached what he would later learn was called the beach. He had seen streams and rivers and ponds and lakes, but never this much water in one place. Although it was night, Goat saw that this water stretched to the horizon and possibly beyond. Goat was startled by this response because he was unaware of anyone else. Goat looked down and saw, half buried in the sand, a creature near his feet. “My name is Goat and I’m from the mountains. Goat thought this was an interesting animal and the name “Crab” repeated in his thoughts. Goat had two legs, his fellow goats have four legs and Crab has eight. Surely, Goat reasoned, this is a surefooted animal. but Goat did not see Crab. Goat’s thoughts kept returning to his fellow goats and, reluctantly, he started his return trip to find his herd. Goat was welcomed back to the herd and he told them the things he saw and experienced, but did not mention Crab. so he never mentioned it to them when he related the stories of his adventure. Goat thought about Crab often because he had many questions to ask him. After some time in the mountains, he decided to return to the beach. When Goat left the herd, he did not know this was the last time he would be in the mountains. On the journey to the beach, Goat realized that he might learn more about Crab, the ocean and the things in the ocean if he didn't ask any questions and only let Crab talk when he wanted to talk. This was almost too much for Goat: every day of his journey his questions seemed to multiply. After several days, Goat reached the ocean on a moonlit night and saw Crab. Goat asked and flinched when he realized asked Crab a question. Crab said while pointing with his right claw towards the pale moon. All crabs count time this way, but Crab wanted to make an impression on Goat and that is why Crab said “I” and not “We“. Goats count time in days and upon reflection, Goat realized it was easier to count moons than days for longer periods of time. In his own way, Goat was impressed with Crab. Crab started to head towards the ocean and was approaching the first waves when Goat realized he was leaving. Goat said in louder than normal voice because of the crashing waves engulfing Crab. “I am busy now, but I can we can talk about the ocean tomorrow”. said Goat as Crab sank beneath the waves not knowing if Crab heard him. In time Goat was to learn Crab was often busy. Despite the untold hours together, Goat was to never know the things that preoccupied Crab. Eventually, Goat decided that thoughts and not things, took much of Crab’s time. Beyond this realization, Crab’s thoughts were a mystery to Goat. The next day Crab appeared as promised and after a few exchanges, Crab began to talk and talk and talk. Goat thought this was the same Crab that he had met before, but Crab’s behavior was different now than it had been the previous two meetings. Goat did not need to ask questions as Crab talked about the ocean, the animals in the ocean, both dangerous and friendly, the plants in it and everything that Goat could want to know about the ocean. Goat protested that he still had questions for Crab. and, without waiting for a response from Goat, Crab scurried to the shore and sank into the sea. Goat was truly puzzled by his new friend. Goats are formal animals and it is not customary for them to leave so abruptly and without a “Goodbye” or similar parting words. The fourth meeting between Goat and Crab was different from the three previous encounters. It was not a one sided conversation and questions were asked and answered by both. Crab learned that Goat had responsibilities to other goats. Crab could barely understand this concept since crabs live alone and not in herds. Upon learning that there was no grass in the ocean, Goat became curious and asked what Crab ate. When Goat heard this, he thought that Crab might eat him. Just as quickly he realized that Crab eating Goat was silly and this idea swiftly passed from Goat’s mind, never to return. Their conversation continued for the rest of the day with Goat telling Crab all he knew about mountain life and leading other goats. It was sometime during the fourth meeting that they realized Crab could not climb to the mountain’s peak and Goat could not swim to the ocean’s bottom. Whether they realized it at the same time or not, only the Creator knows. Ultimately, they reached a compromise and lived on the beach. The beach was ideal for both since Crab was near the water that he felt comfortable in and Goat, if need be, could leave the shifting sands of the beach for firmer ground. Through the ensuring years, they would learn about more than animals and plants under the ocean and upon mountains. They would learn about one another and themselves. Crab feels that Goat is embarrassed by his fish tail, but Crab never mentions this to him. Goat knows that Crab thinks about a lot of things, but rarely talks about them. Crab notices that when Goat is in the ocean, Goat is more playful. But when Goat returns to the land, he becomes serious again. Crab never mentions this either. Goat knows Crab does not have many friends. Crab feels that Goat must miss his friends on the mountains. Goat and Crab lived for many, many moons on the beach. took them and placed at opposite ends of the heavens. but as a constant reminder of how Goat and Crab are connected to each other. To this day, people can see either Goat or Crab in the night sky. Stargazers insist an important event occurs when the moon is in what they call the sign of the Crab. Although Goat and Crab talked for many years and about many things, one word they never spoke. not only between themselves, but towards the Creator and His creation. Available at fine booksellers nationwide. 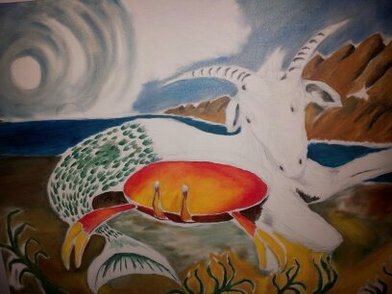 "Goat and Crab", 2009, unfinished, oil on canvas. Author's collection.